Think touch of the wings of birds or sensitivity of flying butterfly. The fragility of these two creatures have inspired Katriina to compose these two part mirrors. The hinges between the mirror panels allow the smaller panel to be moved. It gives possibility to investigate and reflect the surroundings. You are not captured in one view only. Perho mirror comes in two sizes and several colours. 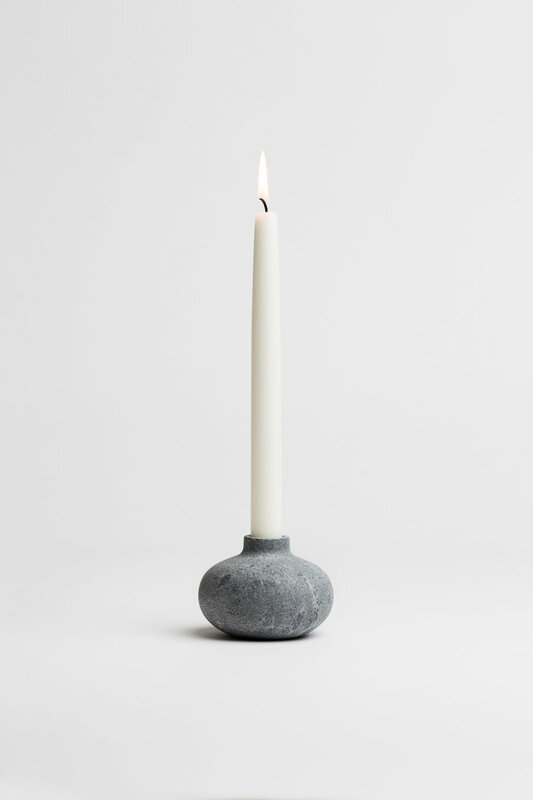 Alku & Aina candle holders are made from Carelian Soapstone and Finnish Curly birch. Both these materials occur naturally where Katriina’s roots are, in Carelia, Eastern Finland. The round Alku (meaning “beginning”) is the base and the beginning of the tale. It reflects how and where the story begins. The taller one, Aina (meaning “always”) reminds that wherever you are, your roots follow and support you and can be the rock to lean on. Always let the flame shine bright! For Katriina Nuutinen Studio. Buy here. Each Lyyli has travelled through the hands of four artisans. The wood originates from trees logged in Joensuu, Finland, the land of a thousand woods. It is created into a lid by wood-turning in the hands of an experienced professional, in the same region where the trees grow. The lid is made specifically to fit a unique glass cup made by a glass blower. 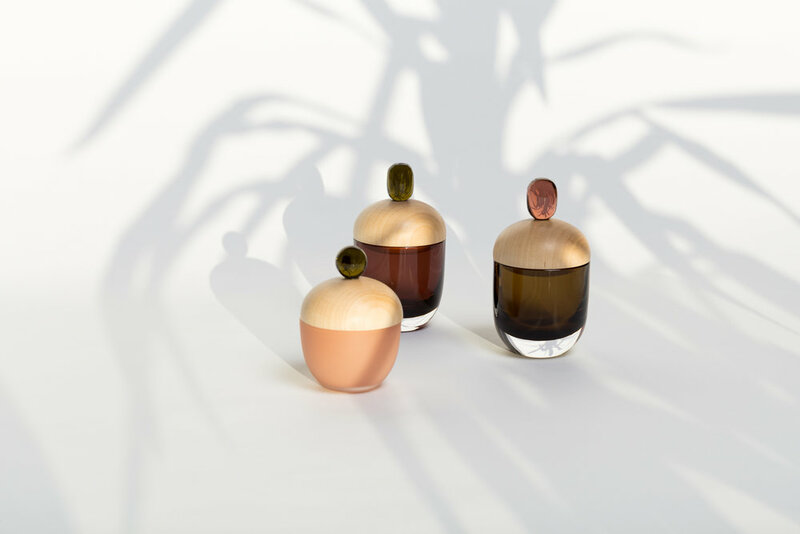 The product is crowned with a glass knob, handmade and polished by glass designers. The combination of matt wood and shiny glass create a nuanced play of light, creating a compelling atmosphere. Combining hard glass with warm wood, the Vieno bottle is designed to combine harmoniously with floral arrangements. Vieno is like smooth, calm water: it gives life to flowers and branches that are given to it, letting them reach out towards new light. It breathes new life into surrounding space. The bottle is an outstanding piece of art also without flowers. The Vieno bottle is crowned by a hand-carved wood cap designed by Antrei Hartikainen. The bark-like feel of the skilfully crafted cap creates an alluring contrast to the smoothness of the glass; like a tree growing from water, light yet strong. In the embrace of Pulmu, flowers breathe and blossom. The vase is particularly suited for low floral arrangements, such as tulips or ikebana arrangements. The timeless design of Pulmu produces an air of serenity also without flowers. Pulmu is fit for any space, but is, perhaps, at its sweetest when kissed by natural light. Pulmu brings out the best of its surroundings and illuminates even the faintest bud. The Pulmu vase is made from the bottom part of the Vieno blank. Vieno bottle and Aamu lamps. Small containers for goods. Finnish birch and handmade glass from Finland. Pieces for home interiors are chosen as focus pieces and as “jewels” for home. Chandeliers and their crystals are the cherry on top in an interior. Hely and Bonbon are jewels of light. Formed by colored glass balls with colous to enhance the harmony of the shapes. In lightings, the light bounces and replicates it self and the glass pieces creating a light full of atmosphere. For Katriina Nuutinen Studio. Orders by requests. For Innolux, Finland. Buy here. The Oma lamp has been designed for young adults, families, grandmothers and career women. The lamp is lit to create a moment and atmosphere just for oneself, to create a pause in the middle of a busy day. Use Oma to light a moment of your own, in your favorite arm chair, with your favorite book. The form of the lamp may even distantly remind the viewer of a giraffe or a gazelle. The materials themselves have inspired the designer to create this composition of forms. The Oma sconce (oma is Finnish for ”own”) consists of a wrought-iron arm and a glass cover that has been mouth blown into a mold. The lamp prototype was produced by handicraft techniques and its structure is simple, yet clever. It may also be manufactured in industrial serial production. This slender utility article combines hard and sturdy iron with delicate and gently formed glass. The Aava (”open sea”) shelf was created through coincidence as well as seamless collaboration with a skilled carpenter. The shelf, originally crafted to be a part of an exhibition stand, was selected to continue its life as a space-saving décor piece. It works excellently under a mirror or by the bed – wherever you need a spot for the small, important things in life. Aava shelves are high quality handwork from Finland. The wooden shelves are made by Puuartisti Oy in Joensuu. The finishing is made with black or natural matt wax. The shelf is attached to the wall with metal support. 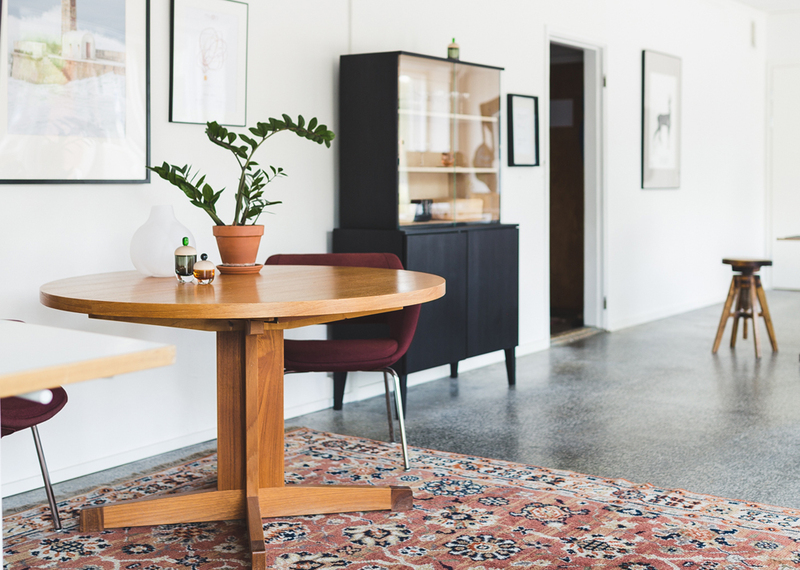 Aava shelves are high quality handwork from Finland. People decorate themselves with strings of pearls, jewellery and chains to communicate something about them. Pieces for home interiors are also chosen as focus pieces and as “jewels” for home. Chandeliers and their crystals are the cherry on top in an interior. The light spread by crystals has a huge part in creating a cosy atmosphere. Hely is a jewel of light. Formed by four colored glass balls with colors to enhance the harmony of the shapes. In Hely, the light bounces and replicates itself and the glass pieces. Creating a light full of atmosphere. For Klong, Sweden. Buy here. 50 pieces unique series of free blown glass vases. The delicate form of the Pulu (“pigeon”) vases is created by free blowing glass. This technique makes each Pulu unique. The wavering, bird-like shape gives each item its own character. Vitrine for Katriina Nuutinen Studio . Buy here. The round and playful Mella handbag is the newest addition to our cork collection. It’s compact size allows you to fit all the things you really need in it. Linen inner part is attached by the snap fastener to the inner bottom of the handbag. It can be removed and easily transferred with it's contents into another handbag. 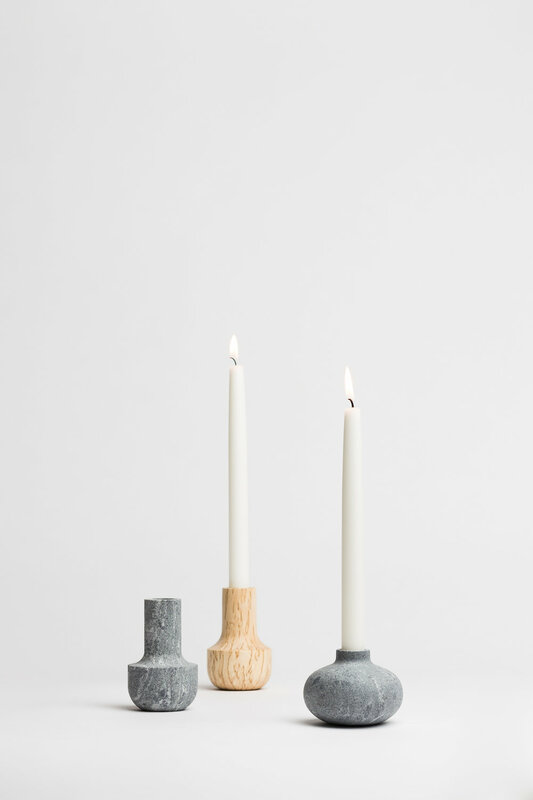 The cork collection is handmade in Joensuu, Finland, in the same city where Katriina’s studio is located. The desire to do meaningful products and acts to improve people’s lives pushed Katriina to create the Aarni bag project. For every bag sold, the studio gives five euros to support the mental health of local youngsters in Northern Karelia through The Finnish Association for Mental Health. The design is also available as beauty bags which can be attached to the drawstring bag to get a pocket for smaller utensils like phone or lipstick. We can customize our products with business logo or slogan. Or maybe you would like to have a Lyyli boxes with the colors of your own business? You can inquire more about business gifts by contacting orders@katriinanuutinen.fi.